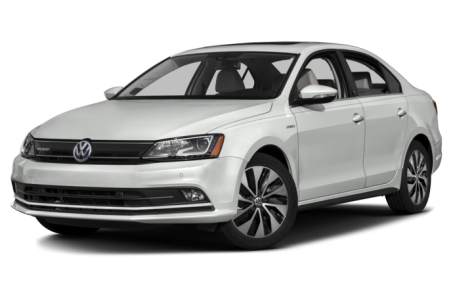 Sorry... the 2016 Volkswagen Jetta Hybrid is no longer being sold as new. Besides the fuel-saving TDI diesel versions of the Jetta compact sedan, Volkswagen sells a gas-electric hybrid model that competes with the Toyota Prius. The five-seat Jetta is Volkswagen's entrant in the compact-sedan segment. Available with a gas or diesel engine, the Jetta competes with the Honda Civic, Mazda3 and Ford Focus. A performance-oriented Jetta GLI and a fuel-efficient Jetta Hybrid are also offered. A 150-hp, turbocharged 1.4-liter four-cylinder is the Jetta's new base engine, and a new available multimedia system supports Apple CarPlay and Android Auto smartphone mirroring on the car's dashboard screen. New active safety features include adaptive cruise control, forward collision warning with automatic braking and automatic post-collision braking, which is designed to reduce the incidence of secondary impacts after a crash.